26 September 2011 - Finishing the user interface with a view to preventing the addin from cluttering the already busy visual studio interface. This means integrating our menu items into the standard Visual Studio menus. The next version is a complete rewrite offering at least the same functionality offered by the Arduino development tool. The final work is to ensure that we are also Arduino1 compatible which includes support for the new Arduino file extensions. We now use standard visual studio commands such as F5 build and upload, double click goto error, simpler setup .The intellisense is complete and the compile/upload works fully. We can even burn new bootladers. Support for single or multiple solutions containing single or multiple sketches is included as standard. 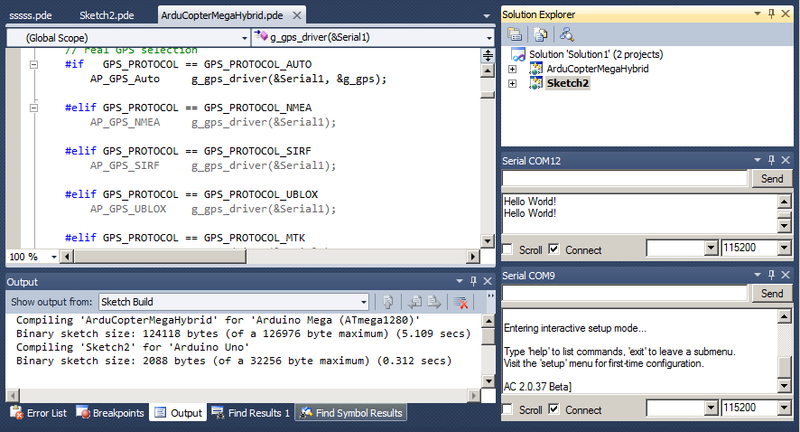 There is also a new api allowing arduino plugins to be created for other development systems. The new version will be released over the next week. Please register in the forum if you would like to be notified when new versions are published.